Rinse wakame, soak in cold water to cover for 5 minutes and dice or add flakes directly, no soaking required. Bring water to a boil and add wakame, onion and carrot. Simmer 5 to 7 minutes. Reduce flame to very low. Add puréed miso and simmer without boiling for 2 minutes. Serve garnished with green onions. Optional Ingredients: tofu, dried tofu, shiitake, maitake, leafy greens, daikon, lotus root, leeks, round or root vegetables, cooked noodles, or mochi. 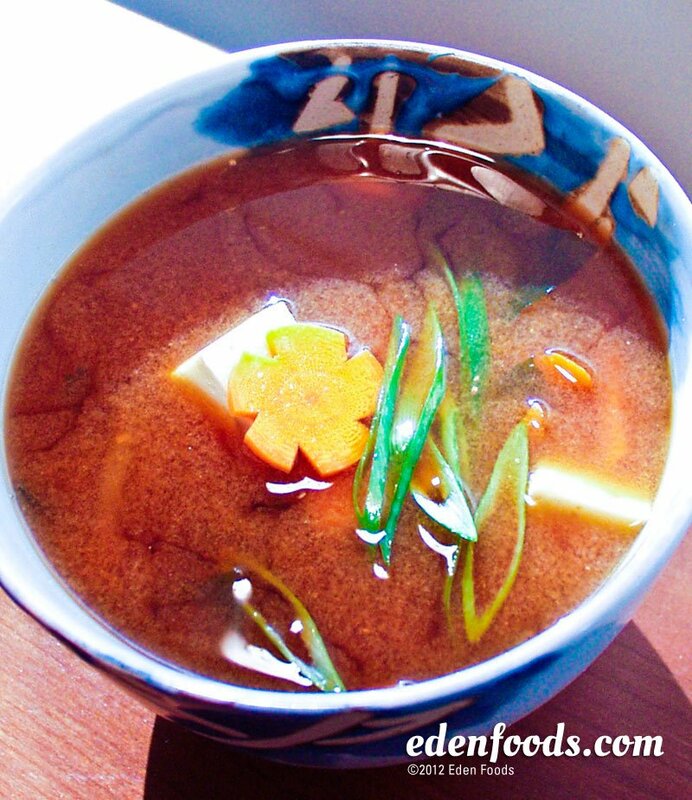 Eden Hacho, Genmai or Shiro Miso may be substituted for Mugi. You may need just slightly mor miso, 1/2 teaspoon or so, if using one of these.